In case you don’t have friends who have posted this all over Facebook/Twitter – The Pumpkin Spice Latte is officially back at Starbucks. While I don’t go gaga over this latte, I am absolutely in love with everything Fall. Growing up in New England, I feel like it’s in my blood to love fall. Apple Picking, Cider Donuts, Pumpkin Carving, Hay Rides, Colored Leaves, Vests and Sweaters, Halloween Costumes… I could go on and on. Although it’s only September, I keep checking weather.com to see when the weather will start its slow change from brutally hot to crisp and amazing. So far, no such luck. But I couldn’t wait any longer, so I decided to do my equivalent of a fall rain dance and make some fall themed food. It’s not paleo but, as I’ve said before, not everything I eat is. It will make you feel all warm and fuzzy on the inside and tickle your tastebuds. 1. Add water, almond milk and pumpkin puree to a pot and bring to boil. 2. Add oatmeal and pumpkin spice, stir. 3. Lower heat to medium and cook until only a bit of liquid is left. Remove from heat and stir in raisins. Once you divide it into bowls, top it with pumpkin seeds, cover with maple syrup and enjoy! This entry was posted in Recipe and tagged diet, fall, foodie, Healthy, healthy eating by fionaboger. Bookmark the permalink. Mmm this looks great! 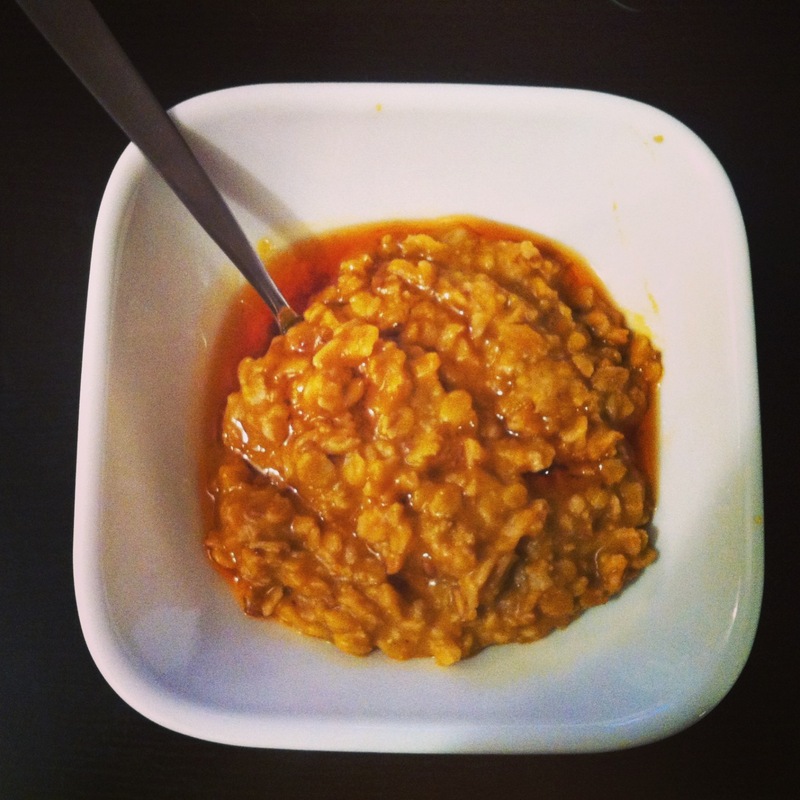 I love pumpkin oatmeal! I think pumpkin is actually my favorite thing about fall!